A trip to Africa can be a life-changing experience. Whether it’s a traditional safari, a cultural excursion, a conservation effort or a combination, we specialize in tailoring journeys to ensure every guest gets exactly that. Intrepid Expeditions strives to create a tour fitted to your interests and budget. With accommodations ranging from luxurious lodges to camping under the African stars, our safaris are designed to give you the most complete African experience possible. From game drives to tracking animals on foot, cultural excursions, fishing, golfing, wine tasting and much more, our goal is to design a safari specific to your interests. There are no cookie-cutter itineraries with Intrepid Expeditions. Call us at 800-893-1157 to talk with a Safari Consultant who will help you design the ultimate African adventure that best suits your interests. Excellent wildlife with very few crowds. 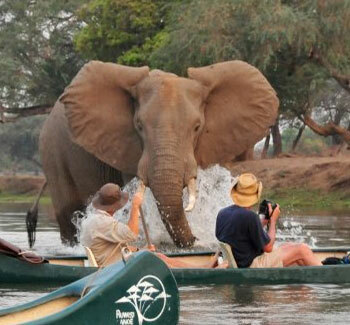 want to be active on safari.